KINTO is a Japanesecompany created in 1972. In the beginning Kinto was a wholesaler of ceramic and porcelain crockery based in Shiga. During the eighties KINTO began to export its products to Europe while staying true to their Japanese roots. KINTO focuses on the design and ergonomics of their products to ensure they appeal to and reach as wide a customer base as possible. Discover our whole range of Kinto manual drip filter coffee makers, teapots, glasses, slow coffee accessories. Dripper kit Kinto Slow Coffee Style glass coffee dripper with jug and wooden brewer stand. 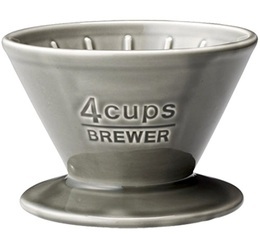 A kit including a glass V60-type coffee dripper with a permanent stainless steel filter, a 4-cup (approximately 50 ml) jug and a wooden brewer stand. Porcelain Slow Coffee Style Speciality 2-cup dripper kit by Kinto with carafe and metal stand. A porcelain V60-type coffee dripper with a 2-cup carafe (250 ml) and a metal stand. This product is part of the Slow Coffee Style range. Porcelain Slow Coffee Style Speciality 4-cup dripper kit by Kinto with carafe and metal stand. 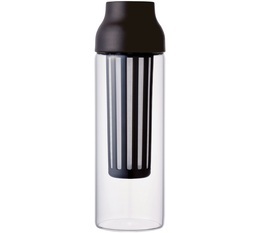 A 1.2 litre polypropylene jug for your favourite cold brew coffee. Comes with a handle and a screw lid. Kinto Unitea Teapot with infuser - 72cl glass and stainless steel teapot with a glass handle that doesn't conduct heat. Ideal to prepare around 6 cups of tea. Discover the One Touch 45cl teapot from Kinto. Just put your loose leaf tea directly in the teapot. The strainer (integrated in the lid) will filter the tea leaves as you pour. Easy to use and clean. Discover the One Touch 62cl teapot from Kinto. Just put your loose leaf tea directly in the teapot. The strainer (integrated in the lid) will filter the tea leaves as you pour. Easy to use and clean. Pack of 60 white cone paper filters for Kinto SCS-02 drippers with a capacity of 2 cups. Pack of 60 white cone paper filters for Kinto SCS-04 drippers with a capacity of 4 cups.